Tall cart can be used for seated or standing applications and supports a variety of equipment on open shelves. Laptop shelf may be set at three seated or three standing heights and rear cord management bins keep cables neat and out of the way. Available with 6-outlet electrical unit that mounts to the cord bin. ECILS1-BK has enough room for a data projector and presentation materials on the top shelf and a notebook computer with mouse on middle pull out shelf. Cart is constructed of steel and rolls easily on casters. The notebook computer shelf can be set at seated or standing heights at time of assembly. ECILS1FF-BK features a six-outlet electrical unit for powering all of your projector and computer equipment. 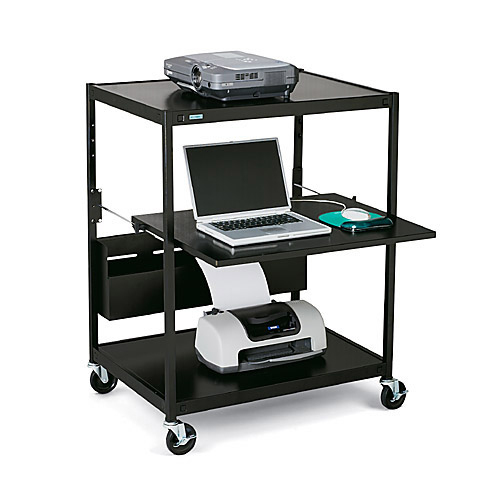 - Ideal for instructional use, large cart provides room for a data projector, speaker, notebook computer with mouse, DVD player, scanner, printer, and support materials. - Top shelf is 42"H and supports a data projector, overhead projector, or up to 24” flat panel monitor which sits on the top shelf. - Pull-out notebook computer shelf is 29"w x 13"d, can be set to seated or standing heights at time of assembly. - Spacious cord management bin organizes all power and data wires. - Heavy-duty 1" square tubular legs with “W” bracket shelf design for maximum strength. - All-steel construction with die pressed shelves. - ECILS1 series carts feature a steel content with 25% to 35% post-consumer recycled steel and are recyclable at the end of the product life cycle. 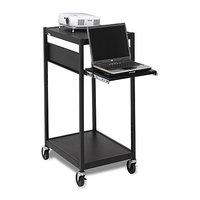 ECILS1 series carts also comply with the GREENGUARD Environmental Institute’s GREENGUARD Children & Schools Indoor Air Quality standards contributing to points toward Leadership in Energy and Environmental Design (LEED) Certification. - 4" Quiet-Glide stem casters, two are locking. Each caster is load rated to 115 lbs. - ECILS1FF comes with an overload protected, 6-outlet electrical assembly with on/off switch and 20’ grounded power cord. - Available in environmentally friendly Black (-BK) powder paint finish.